Veteran umpire and crew chief Ted Barrett officiated his 3,000th career regular season MLB game during Saturday's Giants-Padres match-up in San Diego. The Reverend Dr. Barrett served as 2B Umpire alongside crewmates John Tumpane (HP), Ramon De Jesus (1B), and Lance Barksdale (3B). 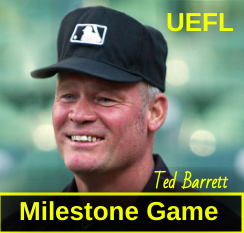 Edward George "Ted" Barrett began the 2019 season with 2,997 regular season games officiated over 25 years in the big leagues, and he hits the 3,000-game milestone just three games into his 26th Major League officiating season. Barrett has also called four Wild Card games, 10 Division Series, eight League Championship Series, and four World Series, in addition to the 2007 and 2018 All-Star Games. Teddy has received a record-10 UEFL Postseason Awards, including two Top Umpire of the Year (2014, 2018), four Honorable Umpire of the Year (2012, 2013, 2014, 2018), and four Crew Chief of the Year (2014, 2016, 2017, 2018) selections. He was inducted into the Arizona Fall League Hall of Fame in 2018. The most recent of his 60 MLB ejections was of Brian Snitker on May 31, 2017. Scott Barry left Friday's Diamondbacks-Dodgers game an inning after he was struck in the head by a 93-mph fastball. In the bottom of the 10th inning, Diamondbacks catcher Alex Avila failed to catch a wild pitch from pitcher Matt Andriese, resulting in a direct shot to the traditional-style facemask of Barry. Barry remained in the game until the conclusion of the 11th inning, upon which he left and was replaced behind home plate by 3B Umpire and Crew Chief Brian Gorman, with 1B Umpire Tripp Gibson at first base and 2B Nic Lentz sliding over to work the third-base position. 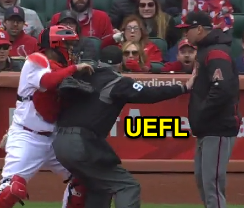 3B Umpire Gary Cederstrom ejected Brewers PH Eric Thames (check swing strike three call; QOCX) in the bottom of the 4th inning of the Cardinals-Brewers game. With two out and one on (R3), Thames attempted to check his swing on a 3-2 slider from Cardinals pitcher Jack Flaherty, ruled a ball by HP Umpire Marvin Hudson and overturned to a swinging third strike on appeal by 3B Umpire Cederstrom. Play reviewed and affirmed by the UEFL Appeals Board (9-0-0), the call was correct. At the time of the ejection, the game was tied, 4-4. The Cardinals ultimately won the contest, 9-5. This is Gary Cederstrom (38)'s first ejection of the 2019 MLB regular season. 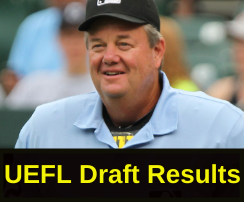 Gary Cederstrom now has 4 points in the UEFL Standings (0 Prev + 2 MLB + 2 Correct Call = 4). 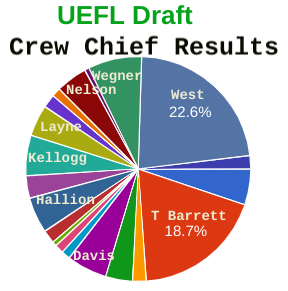 Crew Chief Gary Cederstrom now has 1 point in Crew Division (0 Previous + 1 Correct Call = 1). 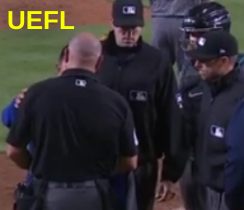 This is the first ejection of the 2019 MLB regular season. This is the first player ejection of 2019. Prior to ejection, Thames was 0-1 (SO) in the contest. This is Milwaukee's 1st ejection of 2019, 1st in the NL Central (MIL 1; CHC, CIN, STL, MIL, PIT 0). This is Eric Thames' first career MLB ejection. This is Gary Cederstrom's first ejection since June 16, 2017 (Bruce Bochy; QOC = N [Balls/Strikes]). Yankees Doubled Up on Infield Fly - Learn the Rule! Not knowing a rule proved costly to a team just two hours into MLB Opening Day 2019. Two Yankees runners didn't know the infield fly rule, leading to a double play as runners tried advancing when they didn't need to. Umpire Fieldin Culbreth's crew of Paul Nauert, CB Bucknor, and DJ Reyburn didn't fare much better, as only 3B Ump Reyburn signaled for the infield fly call on a pop-up in front of home plate. So our Analysis of the Season (so far) brings us to the Bronx and a common rule that in this day and age at baseball's highest level still gets botched by players who don't realize the situation. The Play: With one out and runners on first and second base, Yankees batter Gary Sanchez hit a pop fly in front of home plate, where Orioles catcher Jesus Sucre dropped the ball in fair territory. Upon picking up the fair ball from the ground, Sucre threw to third baseman Rio Ruiz to second baseman Jonathan Villar (to shortstop Richie Martin to second baseman Villar to catcher Sucre), trapping Yankees baserunner R2 Luko Voit in a rundown, Voit having taken off from second base when Sucre dropped the fly ball. After Sucre applied the tag on Voit, the inning was over and the Yankees out on an infield fly-assisted double play. Culbreth observes Sucre dropping a fly ball. The Proper Call: We'd like to see a declaration from our action umpire of "Infield fly, if fair!" because the pop-up could very well become a foul ball due to being so close to home plate. We'd also like a ruling on the interaction between catcher and batter-runner (remember, the catcher is entitled to field the ball with protection from BR interference and the principle of the Armbrister tangle-untangle applies). 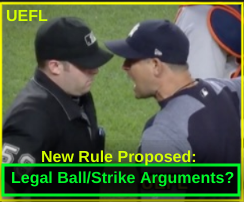 Finally, when it is apparent there is no interference and the dropped ball is fair, we would like a signal for the fair ball (point fair) and another reiteration of the infield fly (point to the sky), now affirming our initial declaration of the infield fly rule and calling the batter out because the infield fly has indeed manifested as a fair ball. The Rule: Our three criteria for an infield fly are: A) first and second occupied (or bases loaded) with less than two out, B) the batter hits a fair fly ball which is not a line drive nor bunt, C) that, in the umpire's judgment, can be caught by any infielder (F1-F6) employing ordinary effort. The following article provides a more in-depth review of the infield fly rule. A sample crew signal for infield fly potential. Analysis: HP Umpire and Crew Chief Fieldin Culbreth quickly determined F2 Sucre was the fielder entitled to field this batted ball. Watching the replay, Culbreth signals "safe" as if to say, "there was no interference or obstruction between Sanhez and Sucre." Culbreth's next mechanic is to point the ball fair when Sucre dropped the ball, having first touched it in fair territory. However, what we're missing from our plate umpire is an infield fly signal. Before the play even begins, we must be alert to the possibility of an infield fly (most crews will communicate pre-play to this end): runners on first and second or bases loaded with less than two out. 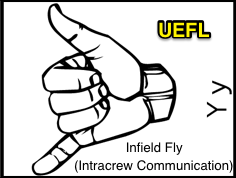 We wrote about crew communication for infield flies in 2017. Read the following article for more. UIC calls IF, which is mirrored by U1/2. Unfortunately, the umpire everyone is looking at here, HP Umpire Culbreth, never signals the infield fly while all eyes are at home plate. So let's assume Culbreth, due to the activity at home plate between F2 and BR, didn't see the fly ball: there's a lot happening and he didn't see the batted ball until it bounced off the catcher's mitt. Fine. 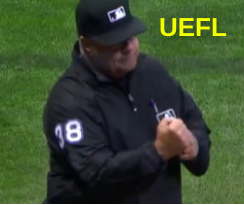 In MLB, we still have three base umpires left to provide back-up, and the video indicates an infield fly signal comes from only 3B Umpire DJ Reyburn, who points to the sky and makes it known this is an infield fly rule application. Oddly enough, though it doesn't appear that 2B Umpire CB Bucknor actually signaled for the infield fly, he nonetheless appeared not to declare R1 Miguel Andujar out at second base when F4 Villar stepped on the base while holding the ball (as the infield fly removes the force), but U3 Reyburn is our crew-saver on this play. The accompanying image from a Giants-Phillies game indicates a crew properly calling and mirroring the infield fly mechanic. Result: Thus, with the batter automatically out due to the infield fly rule, the runners are no longer forced to advance. They do so anyway, and the crew properly officiates the rundown and tag on Voit for the final out of the inning. What happens if an umpire fails to call IF? Other Levels (NCAA / NFHS): Assume in a crew of two or three, U3 wasn't there to bail us out: no Reyburn = no infield fly call. What happens when the crew fails to call an infield fly on a play that is clearly an infield fly - not a borderline "ordinary effort" dispute, but an obvious fair fly ball on the infield? Whereas OBR (professional baseball) and NCAA (college) rules state that an infield fly only exists when an umpire makes such a ruling, the National Federation of High Schools rulebook contains the following phrase: "both teams have the responsibility to know when conditions exist for an infield fly" (10.2.3 Situations F&G). Thus, under NFHS, the possibility exists for an infield fly to be ruled after the fact even if no umpire on the field signals it in real-time (the best prevention for this is to be prepared beforehand). 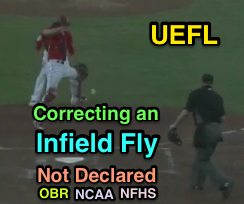 As for OBR/NCAA, if a crew fails to rule an infield fly during the play, the general guidance is to place runners where the crew chief believes they would have been had the correct call (of infield fly) been made (OBR), while NCAA notes that crews "should be conservative on their placement of base runners." Just as in HS, the best way to prevent this is to be alert and prepared to the possibility and likelihood of an infield fly. Related Post: Forgetful Infield Fly - Reversing Calls Across Levels (3/21/18).